Imagine the unlikely situation in which I have been signed by a Premiership football team. Let’s call that team Livtottenchestersea Citynited. Imagine now that instead of actually playing for the oily badgers (which is of course the nickname given to Livtottenchestersea Citynited, who of course play in wet-look black and white stripes), I give a fee to tiny-foreheaded wayward-pass-machine Steven Gerrard, who turns up wearing a mask of my face and a shirt with my name on it, puts in 110% in the way that only a footballer can and plays far, far better than I ever could. Then imagine finally that I pick up my exorbitant wages and go home without even having kicked a ball. It’s too far-fetched to be believable, isn’t it? If it actually happened then you’d say that it was stranger than fiction. If you were a vacuous reactionary right-wing tabloid columnist then you’d claim that you couldn’t make it up. Even though – crucially – it is fiction and I have just made it up. And yet, the situation that I’ve described above is essentially what happens in the world of ghostwriting. Why? Why is it accepted that celebrities (and it is usually celebrities) can claim to have authored a book that in many cases I doubt they’ve even read? Why is it OK for someone to take credit for the creative efforts of someone else? How many industries would tolerate someone simply stamping their name on something and claiming it as their own work? OK, I suppose I can think of a few – I doubt Britney Spears really puts time and effort into creating her new perfume, or that Jamie Oliver really sits down with pencil and paper and draws up designs for his new saucepan – but they’re more about endorsing a product than claiming to have created it. You know, approving of it. That’s not really the case with a ghostwritten book; it seems peculiar to the publishing industry. It seems strange, doesn’t it? The more you think about it, the more weird it seems (like the word “weapon”…read it and say it in your mind over and over again, you’ll soon begin to question the warped logic that decided that such a collection of letters should result in such a combination of sounds). Now, I’m not talking about this situation as though it’s a problem – people are free to buy whatever they like, and free to believe the fiction that Katie Price really is the Saul Bellow of page three; I’m not a vacuous reactionary right-wing tabloid columnist, after all – and I don’t want you to think that I am bitter about it (I am, but that’s only because I’m bitter about pretty much everything) or that I think that it shouldn’t be allowed. I’m just talking about it because, when you think about it, it’s a funny situation, and I don’t understand how we’ve reached the stage where the fact that it happens is both well known and tolerated. It’s weird, and that’s all I’m saying. NB I didn’t write this blog post. 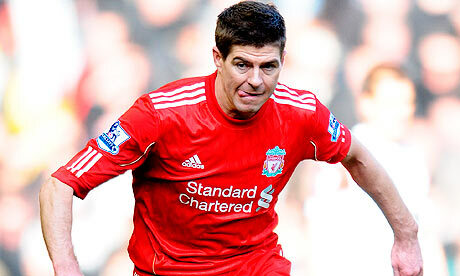 Steven Gerrard did. Previous postFlash Fiction: "By Default"
I think in sports they're called 'ringers', but they've gone out of fashion somewhat because it was realised it's easier to pay someone on the other side – or even the whole opposing team – to either 'take a dive', or just make some minor but crucial to the outcome errors of judgement. Not defending ghost writing in any way and agree in principle with what you're saying, but ghost writing is in many ways far more upfront and honest than the outright cheating that goes on in sports. Katie Price is quite open about her input (or lack thereof) to her books and freely admits that it's more about 'the brand' and endorsement. The ghost writers do get paid, and do have a choice, and while one might argue they're effectively being forced into prostitution as the means to an end it does, presumably, open doors for them that might otherwise be closed. If they can 'bang out a Katie' and the market wants Katie style product then what's to stop them submitting Katie style product without the branding? I mean, Katie doesn't own the monopoly on that kind of drivel, does she?